It's a brand new year, brand new month and we have a brand new muse at CASE Study! It's the fabulously talented Amber Kemp-Gerstel from Damask Love (a totally cool website btw!). I'm always in awe of this lady's work, she is amazing!! Check out her adorable inspiration card. I stuck pretty close to Amber's design, I love those cascading hearts! So, I super-sized the hearts and did a little repeat stamping just using two colors and the cool woodgrain heart from My Heart by Waltzingmouse Stamps. I used Memento Rose Bud ink and Lady Bug ink and just stamped them in a random pattern, stamping twice without inking up between stamping to achieve the lighter tones. The text I stamped using two alphabet sets, one (Typewriter Letters) from Hero Arts and one (Chelsea Alphabet) from Inkadinkado. 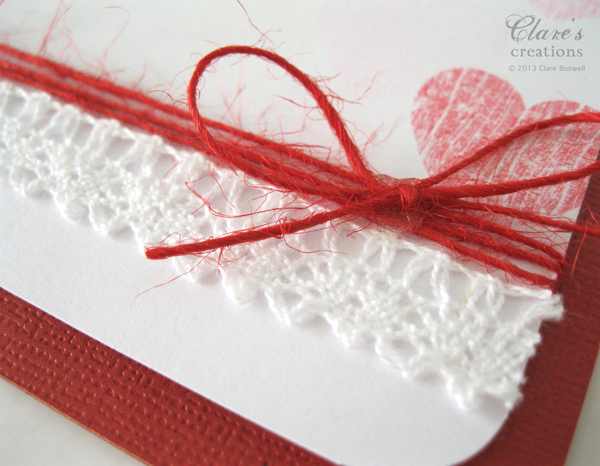 Never content to leave the white space alone, I added a little subtle lace and some red buttonhole twine. I was pleasantly surprised with the results, although I did practice my stamping on some scrap paper first, I was a bit nervous of the random stamping! WOW! Another absolutely breathtaking card, Clare! 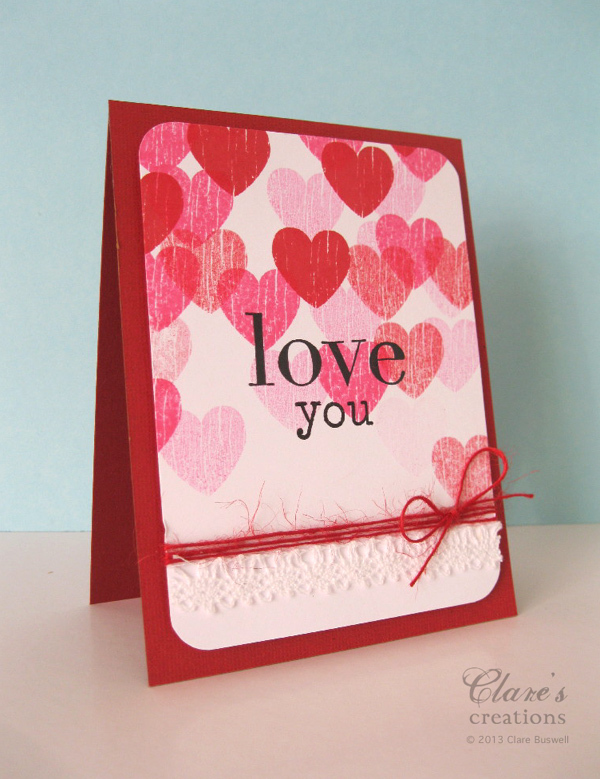 Love the stamped heart background, it is BRILLIANT! Beautiful card! And your random stamping looks great! Clare, I love your card. 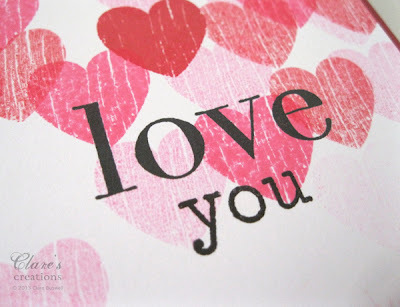 For those of us who cannot purchase the stamp set at this time, but might have a woodgrain stamp already, we could us the "kiss" technique for this. Love that woodgrain heart and the two step stamping. I was drooling over this on Facebook the other day Clare! 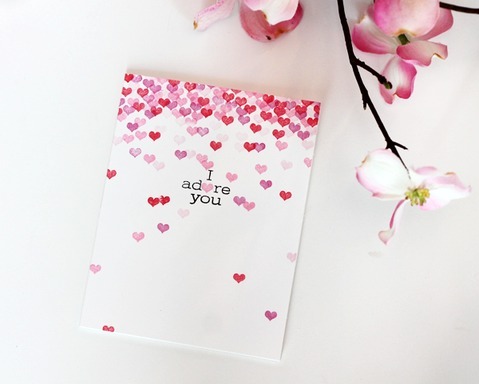 You make the most elegant cards - so simple, but so very gorgeous!! I think this is lovely - the shades of pink and red, the pretty lace trim and twine - just fabulous! Gorgeous-so simply yet effective. Love it. 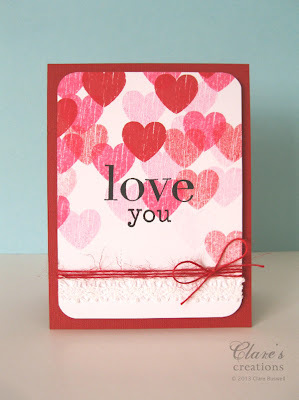 I love your take on this card...so gorgeous! I love the unusual way you did the diecut on the man card. They are all pretty. Thanks for sharing.